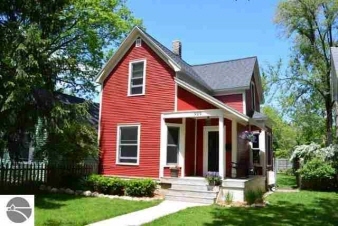 Description: In-town victorian charmer. Original woodwork & hardwood floors. Vintage kitchen w/ ceramic & butcher block counters, glass paned cupboards, walk-in pantry. Updated baths w/ old style character, glass block, ceramic tile floors. Tall ceilings. Cedar closet. Gorgeous front door & foyer. Roomy back entryway. Covered front porch. Many major updates. Extremely energy efficient. Nicely manicured yard w/ plenty of perennials. Fenced back yard perfect for privacy, kids & pets. Convenient in town location to walk or bike to all the amenities & festivals that tc has to offer.